Since all Nespresso coffee pods are the same and can be used in any Nespresso coffee machine, you can take your pick of the variety of Nespresso pod coffee makers. But which one is the cheapest for a beginner? A quick look through any online retailer will show you that there are a whole range of Nespresso coffee machines available. The more expensive ones tend to be more shiny with extra features. Expect lots of reflective chrome-like effects, taller more impressive kitchen-dominating builds, and built-in milk heaters and frothers. 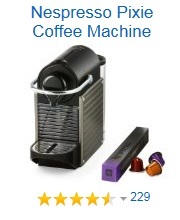 But at the budget end of the spectrum, what is the cheapest Nespresso pod coffee machine that you can buy, either for yourself or as a gift to a friend or family member? At the time of writing, the straightforward answer is that the Nespresso Inissia pod coffee machine is the cheapest Nespresso coffee maker currently available. The Nespresso Inissia is a great budget coffee machine. It does everything you want your Nespresso coffee machine to do, it makes the coffee! OK, it doesn’t have the built-in milk warmer and frother, but for the price you are getting a brilliant little coffee maker. And it’s not too big, so it doesn’t take over your kitchen. The Nespresso Inissia is available in a range of colours, so there will be an option for colour matching to your kitchen, even if it just is the neutral white or black versions.